1Part and full day available to some four year olds. 2Part-day available to some three and four year olds. Source: CICH table created using data adapted from Friendly, M., Grady, B., Macdonald, L., & Forer, B. (2015). Early childhood education and care in Canada 2014. http://www.childcarecanada.org/publications/ecec-canada/16/03/early-childhood-education-and-care-canada-2014 – accessed July 24, 2017. Kindergarten (full or part-day) is available for 5 year-olds in all Canadian provinces and territories. 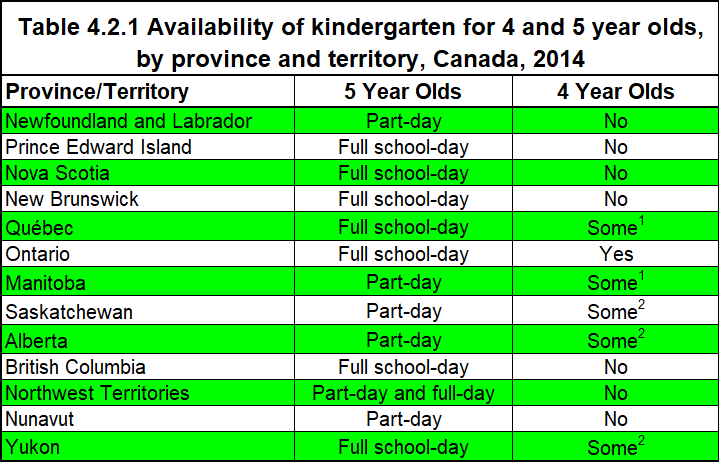 Full school day kindergarten is available for 5 year-olds in 8 provinces/territories. Kindergarten access for 4 year-olds is far less available. 3OECD (2011), Starting Strong III: A Quality Toolbox for Early Childhood Education and Care. http://www.oecd.org/edu/school/startingstrongiii-aqualitytoolboxforearlychildhoodeducationandcare.htm accessed July 29, 2017.